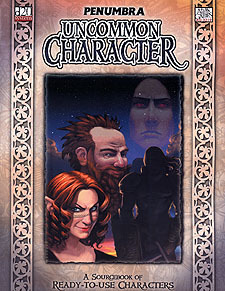 Within this book await villainous, noble, and not-so-noble characters alike - fascinating personalities designed to spark adventures large and small. Here you'll find a half-fey bard with a heavenly voice and a veiled face; an exiled paladin gathering allies to reclaim his heritage; the daughter of a celestial, who is tempted by a "friendly" imp; and a gnome illusionist who thinks he's a solidified mirror image - and may be right. Each character comes with adventure seeds to broaden the horizons of any fantasy world, along with new feats, spells, items, prestige classes, and more, all ready to be added to your campaign. 36 non-player characters, with detailed histories and descriptions including complete d20 System stats, all ready to be introduced into a campaign at a moment's notice. Plus familiars, mounts, companios, and even an aquatic paladin's war-eel! Over 100 adventure seeds linked to specific NPCs. New magic items and artifacts like the 'rib cage' and the 'iron skull of Brodan'; new spells like 'control mirrior image' and 'Bezmurn's beacon'; new monsters like the cackle dead; new feats like Rally, Dextrous Grapple, and Strange Luck; new deities worshiped by ogres, nixies, and humans; new prestige classes like soul crafter and the halfling hawkeye; and a new race that dwells disguised just beyond the bounds of human society. A quick-reference index of d20 material, and NPC lists arranged by Challenge Rating, alphabetically, by race, by class, and by alignment to make finding a suitable NPC or your favourite crunchy bits fast and easy. Requires the use of the Dungeons and Dragons Players Handbook, Third Edition.